Christian Daguerre is a freelance investigative reporter. Understandably nicknamed Dagger, he is at first conned and then willingly begins to work for the wealthy news magnate, Hannibal S. Kydd. This multimillionaire, dubbed Captain Kydd, has learned that coupling a vendetta against would-be terrorists around the world and first-hand reporting on the events makes for good ratings as well as a do-good feeling. Dagger is a well-honed reporter who has traveled all about the world, including tours with American soldiers in Vietnam. He is an award-winning writer who knows how to handle himself, which is good as his adventures get him into considerable number of messes. On assignments during Vietnam, he was thrown out of the country twice for reporting things the authoritied didn't want revealed and yet still found a way to sneak back in. He parachuted into enemy territory for a scoop, including a night drop along the DMZ. In the task he had before the first recorded adventure, he had, to report on Cubans intent on taking back their homeland, trained with them in Florida, perfecting his abilities with weapons and stealth. He is included in this compendium because his part-time employer, Kydd, has instituted a crusade against international terrorists and drafted his prize reporter for service in that endeavor. Furthermore, Dagger, to stay alive, does a lot more fighting the terrorists than he does reporting on them. This series is another in the impressive line of action/adventure series that Gold Eagle put out, along with the Executioner line. The author, Ray Obstfeld, even drafted several novels in that series. Apparently, however, this one did not catch on as it only lasted two missions. Dagger becomes an unwilling participant while on vacation in Mexico when word is spread by a scheming Kydd that he is on the trail of a dangerous terrorist. 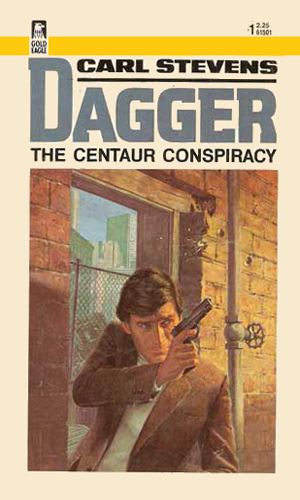 Dagger, though, isthe last to get the message and is fighting for his life without knowing why. 'Dagger cuts through the bushido!' That is the tag line for this adventure in which Daguerre heads to Japan where information comes that the terrorist group, the Red Army, is about to unleash a bloodbath with Americans living there as the victims. For action, this is a darned good story. The author makes the main character understandable and believable from the very beginning and the action is well plotted and executed. As a spy story, it is a bit weak but as a men's adventure as it was intended, it is enjoyable. 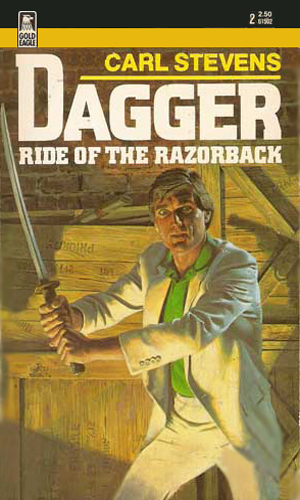 The character of Dagger is a refreshing one from the type usually presented by the publisher Gold Eagle as he has feelings and deep regrets. He also doesn't like violence, though he is good at giving back what is handed him. The fact that a highly skilled author, Mr. Obstfeld, was the man writing it certainly is a plus to picking it up and reading it.